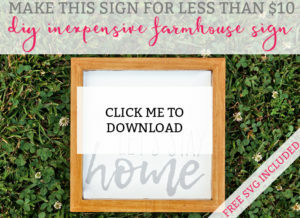 I love the look of painted farmhouse signs. But buying wood, cutting it, and preparing it can be a hassle. 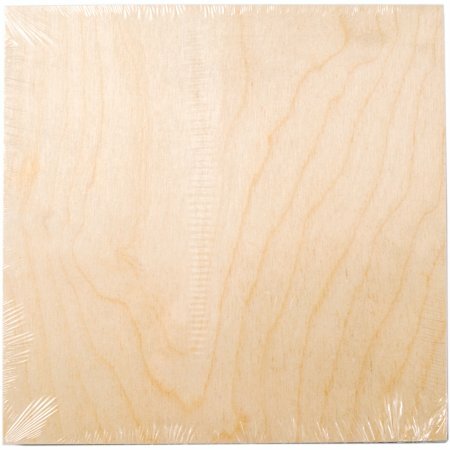 Now, retailers like Michael’s, Hobby Lobby, and Walmart are catching on and creating pre-made blank wooden signs. The only trouble is that they can be a little pricey (unless you have you have a coupon). Recently, Walmart released these adorable blank wooden signs. The best part is that they are only $5.00. Even better, they come framed. 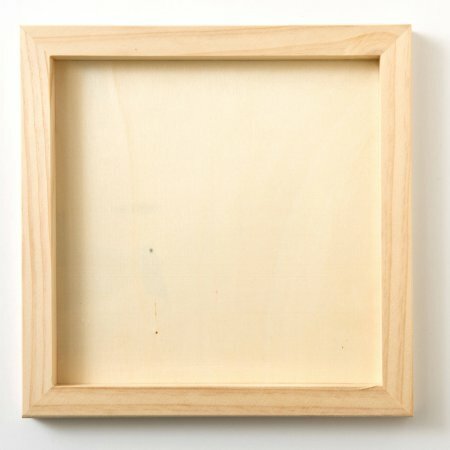 See – just a simple piece of wood ready to be painted. I know I said that it comes framed – but the picture above doesn’t show a frame. That’s because you’re going to paint it in a very nontraditional way. Instead of painting the front, you are going to flip it over and paint the back! See what I did there? It’s such a simple hack that will give you the look you desire without having to create a frame. Now, when you’re shopping, make sure to look at the back for any imperfections. I received two and one was fine on the back but the other had some marks (I decided since I was going for a rustic farmhouse look, that would be okay. 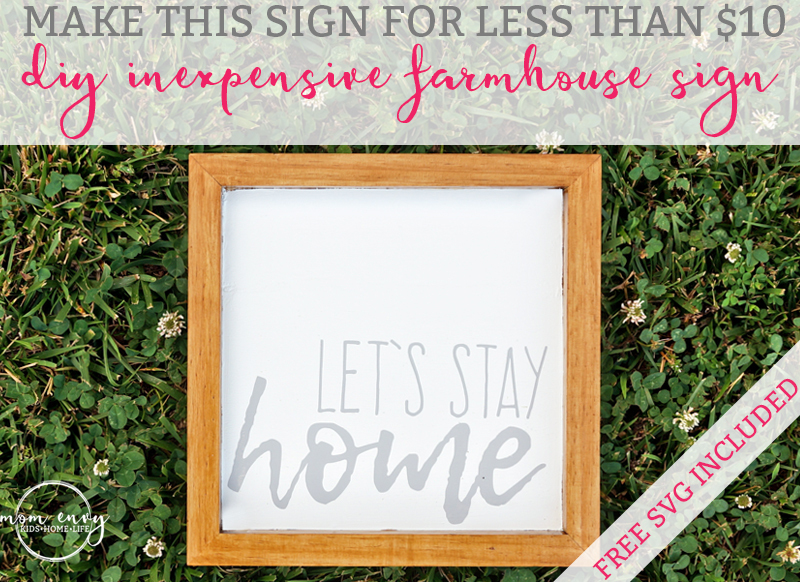 Your sign will cost a little bit more than $5.00. I used some paint I had on hand and just a small bit of vinyl so I would say the total cost is under still $10 when you use a little bit of each material you have on hand. (If you have to purchase all of the materials because you don’t have them on hand, it will cost you more. But they’re all create DIY products to have on hand!) You can use contact paper to make your stencil but I much prefer stencil vinyl. If you haven’t bought it yet, you have to. You’ll be amazed at the crisp lines you get! See those lines? All thanks to my stencil vinyl. Now, for today’s posted I decided to make a video. Of course, half-way through, I didn’t realize that the memory card had filled up so you’ll just see me pretending some in the middle (I’m getting the hang of this video thing – I’ve always done pictures on my blog but am trying to do some how-to videos for you, too!). If you aren’t into watching videos, I have included some typed directions below the video. 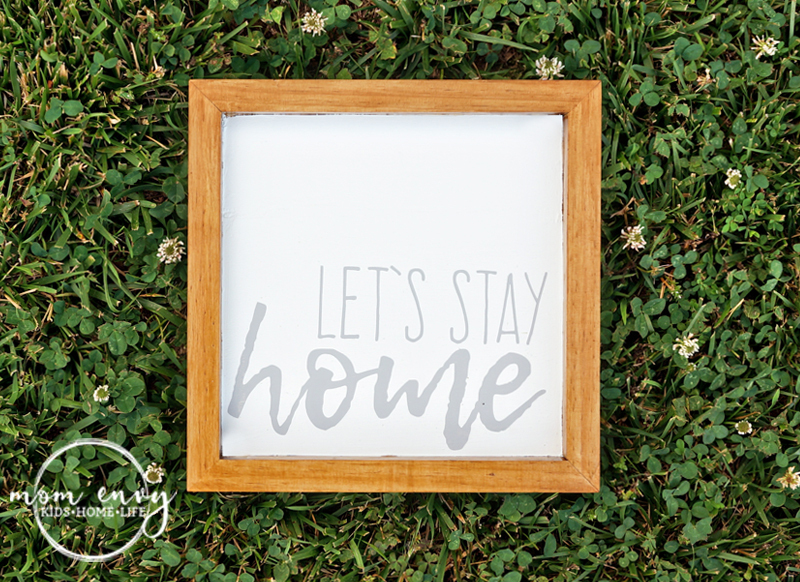 Making this sign as a gift? 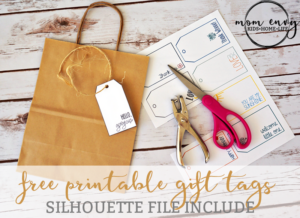 Check out these free adorable printable gift tags you can cut with your Silhouette, too! Here is the final project. I love the way that it turned out! Lightly sand the frame. Wipe clean. Tape off the center of the sign. Stain the sign in your desired stain color. Mine took 2 coats. Allow drying time based on your stain’s directions. Place painters tape covering the frame including the inside to make sure the paint doesn’t get on the frame. This can take a bit of work. I used an exacto knife to cut along the edges inside to makes sure the entire frame was covered. Paint the base color of your sign. Cut the vinyl stencil on your machine to your desired size. Weed the letters out of the stencil. Place the vinyl on the sign. Use a scraper tool to burnish the surface to make sure it really is sealed to the vinyl. Paint a small amount of mod-podge over the stencil area. Make sure to smooth out any globs. Allow to dry (at least 20 minutes). Using your base color, paint a thin layer of base paint over the stencil. 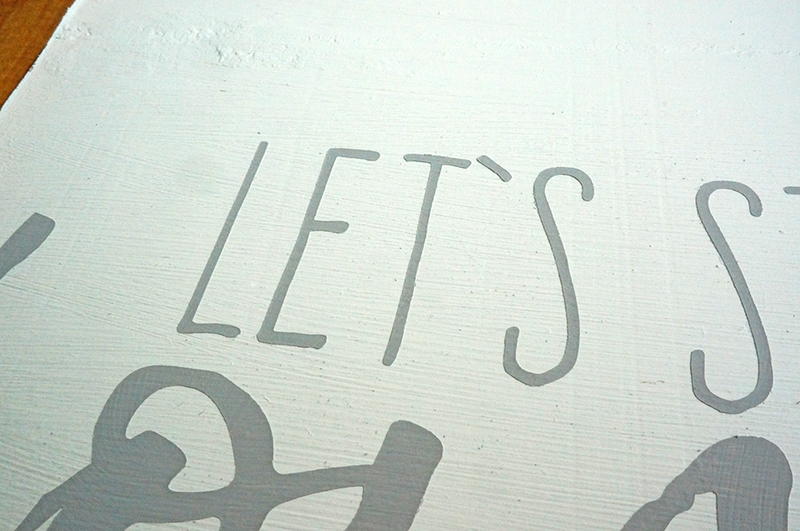 Using your text color, paint a thin layer of paint over the stencil. Using your text color, paint a second thin layer of paint over the stencil. Using the chalk paint wax or a clear sealant, seal the sign. That’s it! 🙂 You have a beautiful painted wood sign! Open the SVG File in your cutter’s program. For Silhouette, you must have the designer edition (or higher) to open an SVG file. Wow, that is a great project to do. I might want to try that sometime. This is awesome! I’ve never thought to turn those premise wood things over for a different look! Thank you! Someone in one of my crafting groups came up with it and it’s so genius. I had never thought about it either! This is so cute and you make it look so easy! So cute and homey! And you make it look so easy. I love this! Thank you for sharing! I am definitely saving this so I can make it myself. I am wanting to do some new décor but money is tight right now so this is perfect! cute idea! i like that it is easy and inexpensive i really love this look for home decor too! thanks for sharing! This is so cute! I love this idea. Super simple! I love this DIY craft sign. I cant wait to make it for my home. This is so fun and so darling! I need to make one for my home. LOVE this!! I’m going to have to try this for some wedding decorations! So cute! I’m moving soon and will be keeping this art hack on hand!